Dawn Vachon’s ceramics practice is the result of several half-sentences and truncated thoughts, arranged together in an attempt to organise the wrinkles and the clamour into something vaguely melodious. 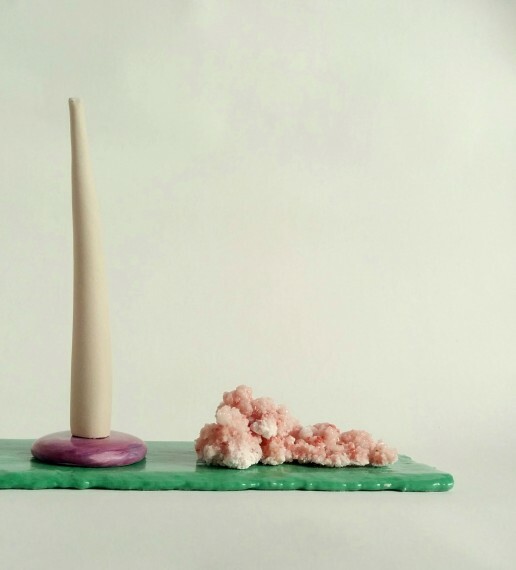 She continually experiments with alternate ways of using common ceramic materials, whether that be glaze for mass, melting clay or otherwise. This leads to an evolving assemblage of sculptural pieces that invert traditional canons of the ceramic medium such as the relationship between inside and outside. For her exhibition at the Dolls House Gallery, Vachon situates objects in miniature faux domestic setting. This arrangement causes the pieces therein and the spaces between them to read as familial relationships. This work prompts the viewer to re-imagine the ambiguous cluster of objects as potential divergent dwellers.